We eat the Sugar-Free Collection (that sounds nice, doesn’t it?) 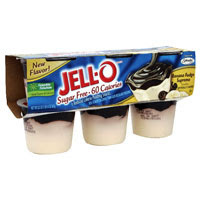 of Jell-o pudding snacks for dessert all the time. Jim’s favorite flavor is Double Chocolate, which he refers to as “Chocolatechocolate”. (I did indeed intend to omit the space between the words: he says it all together!) Mine has been either Vanilla or Dulce de Leche…until now. This new flavor, Banana Fudge Supreme, is unbelievable. And no, I am not receiving any money or free pudding for posting about it (God, I wish!). It is really like having a miniature banana split, without feeling gross afterwards because you just ate too much ice cream. Try it: tell me what you think! Yum, I’m going to have to get some of this when I shop next!! This sounds delish, I am definitely going to try it.